The Historic Leonid Meteor Shower Peaks Tonight. Here's How to See It. The key to witnessing any stunning celestial event -- whether it's the Northern Lights or a total solar eclipse -- is being in the right place at the right time for a perfect view of the heavens. Thankfully, you can see space’s latest spectacle just by looking up on Friday night, when the historic Leonid Meteor Show lights up the sky. 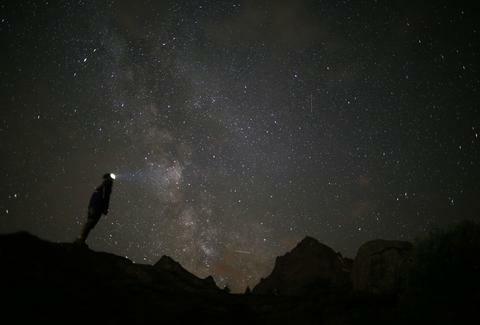 The Leonid Meteor Shower, which has produced some of the Earth's wildest meteor displays, is expected to peak late on Friday, November 17, into early Saturday, November 18. The annual phenomenon is active from early November through early December this year, but you can expect to see anywhere from 10 to 20 meteors of medium brightness every hour during the shower's peak. Of course, you'll have to drag yourself out of bed at an absurdly early hour and go somewhere dark enough for a good view of the sky first. Besides getting up on time (set at least two alarms), all you have to do is look for the constellation Leo the Lion, from which the meteors will appear to emanate, although the meteors will be visible throughout the night sky. The good news is the Crescent Moon won't be bright enough to hinder your view of the falling meteors, while the not-so-good news is that you'll likely have to be patient to see many while you stand out in the cold. Just don't blink too much or nod off, as these meteors are particularly fast. "They're the fastest of all meteor showers," Bill Cooke, who leads NASA’s Meteoroid Environment Office, recently told Thrillist. "Leonids move at about 45 miles per second. Blink and you'll miss them." While the Moon likely won't get in your way, there's a chance that clouds could obstruct your view if you're attempting to watch from much of the East and the Great Lakes. However, folks in the northern Plains, the Southeast, and much of California will have ideal weather for watching the show, according to a report by AccuWeather. But no matter where you are, it's probably going to be chilly, so be sure to dress warm and pack yourself a hot toddy to sip while you look up. Perhaps the biggest challenge you'll face is getting far enough from the light pollution of the city or suburbs, so check out this handy dark sky map to track down the darkest areas near your location. Thankfully, you don't have to bother with binoculars or telescopes to fully enjoy the meteors, but you will need to give your eyes some time to adjust to the darkness before the height of the shower arrives. The Leonid's 10 to 20 meteors per hour won't be nearly as spectacular as the 120 meteors per hour expected at the peak of the Geminid meteor shower in December, but the show is still special and historic. In fact, the Leonid Meteor Shower is what first led to meteor science, thanks to its tendency to put on ridiculously spectacular displays every 33 years. A particularly intense meteor shower produced more than 100,000 meteors per minute, leading some viewers to think the sky was on fire. Another particularly strong shower produced thousands of meteors per minute in 1966. The next big one will likely occur in 2032. All said, the Leonid Meteor Shower is certainly worth watching, but you can probably get away with holding out for a bigger shower to set up camp somewhere out in the dark and cold. Oh, and you can always settle for watching a livestream of the show, of course. Tony Merevick is Senior News Editor at Thrillist and wishes he could go somewhere dark enough to watch this. Send news tips to news@thrillist.com and follow him on Twitter @tonymerevick.